Back in September, iOS users had a choice; They could upgrade to iOS 7 or lose 3.1GB of space to an installation file which would automatically download to the device when connected to the mains. Previously, this file stayed on the iPhone or iPad whether users liked it or not, but, help could be at hand in the form of the new iOS 7.1 update, thought to be arriving soon for iPhone, iPad and iPod touch owners. 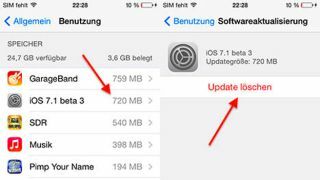 The latest (third) Beta version of iOS 7.1 was seeded to developers last week, but German site Macerkopf.de (translated) have spotted that those devs yet to install the update are now able to delete the over-the-air installation file. That would suggest, when iOS 7 eventually lands with every day users, they'll be able to do the same and reclaim that lost hard drive space. Will it make the cut? However, it is also possible that Apple will choose not to carry this feature beyond the Beta stage. It often tests things out on its developer community before deciding not to proceed. iOS 7.1, when it eventually arrives, is likely to bring some design tweaks to key apps, a redesigned dialler and the long-awaited iOS in the Car platform. There are few hints regarding when Apple will choose to send out the update, but recent reports have suggested users may have to wait until March.